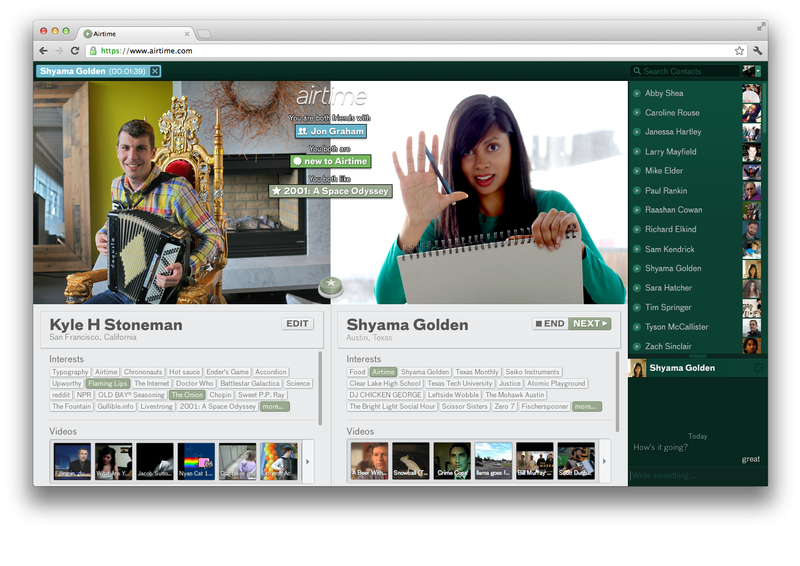 Airtime, the next act from Napster co-founders Shawn Fanning and Sean Parker, launches to the public today. The service is a Web application for person-to-person video calling, with an emphasis on matching people who have common interests. It has been in the works for nearly two years, and has a clear ancestor in Chatroulette, the anonymous video chatting start-up that Fanning and Parker had advised for a time. Fanning and Parker gave me a tour of Airtime last week, in preparation for a press launch today that’s sure to be full of razzle-dazzle and celebrities like Snoop Dogg and Kristen Bell. Like Chatroulette, Airtime also allows for anonymous use, but it is built on top of the Facebook platform and requires a Facebook account. If users behave inappropriately, they are kicked off the service. So the system knows who a user is, whether or not the user elects to share his or her name with a video chatting partner. Plus, they’ve now raised more than $35 million in funding, and have been working on this for the past two years without a public release. But why would we want to video chat with people we don’t know? Parker and Fanning argue that they are helping bring serendipity into a world where people’s online social graphs are set. Airtime is a “social discovery” application for helping people make new friends online, not necessarily for the purpose of dating. It’s a category with many other companies — for instance, open social networks like Badoo and MeetMe (formerly MyYearbook), video chat companies like ooVoo and Rounds, and mobile location apps like Highlight. Fanning and Parker think the video aspect of Airtime is particularly important; the medium of synchronous video is highly intimate and reciprocal, tending people away from multitasking and toward reading each other’s body language. There’s no lurking. The two have a particular challenge in that Airtime will require a significant number of concurrent users — they estimate 5,000 to 10,000 — before users can have a good range of options to find new people. Their own notoriety should help with that — but if not, Airtime will look a lot like the original Color, a start-up with tens of millions in funding and nobody using it. 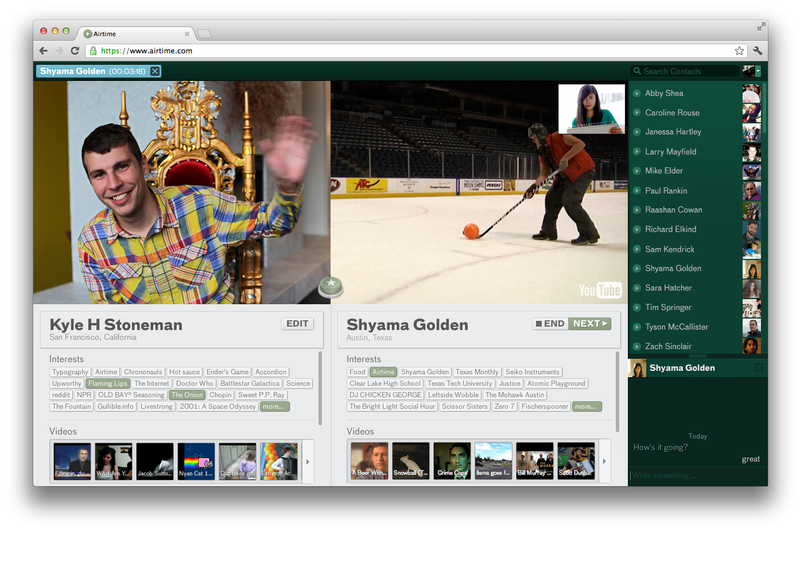 The Airtime interface looks like a desktop, with a row of available friends on the right side and two video panes in the middle. Users log in through Facebook — Airtime doesn’t even have its own login system. Then users can ping their existing Facebook friends — it turns out that Airtime is also trying to be a Skype competitor — for a video call, without requiring additional downloaded software beyond Flash. Through integration with XMPP on Facebook, friends will get Airtime alerts through instant message chats, and can click to get to Airtime directly. Or they can elect to have Airtime find them a conversation partner based on common interests and mutual friends, according to Facebook. In order to combat spam and scamminess, users can’t target chat partners based on a specific interest, or by their gender or age. However, the Airtime system is built to track markers of a successful match, like conversation length, to try to better match people as they use the service more. Within Airtime, users can watch videos together. They can click to give each other props, prompting a shower of stars on the screen. What can’t they do? Use Airtime from mobile or share music. An iOS app is weeks away, Parker said, while music deals are on the horizon. Additional planned features are more gamification stuff and video effects, including games built on the Airtime platform, Fanning said. Another thing Airtime users can’t do is have multiparty chats, though they can conduct multiple one-on-one chats simultaneously. That means it will be harder for Parker and Fanning to use their celebrity connections, like Google has been doing with Google+ Hangouts, where a big star draws a big crowd.